The VIA VT6651 Solomon-B WLAN is an 802.11b media access controller (MAC) with an integrated baseband processor (BBP). It is the heart of the Wi-Fi CERTIFIED Solomon-B 802.11b Mini-PCI Module. 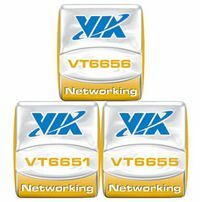 The VT6651 is built on a hardwired architecture with support for the descriptor-based DMA engine without requiring additional external SRAM. The on-chip A/D and D/A converters manage the input and output of both I and Q signals. The VIA Solomon VT6655 WLAN controller, a single chip solution featuring an IEEE 11a/b/g media access controller (MAC) and integrated baseband processor. Enabling data rates between wireless devices of up to 54 Mbps. The VIA VT6656 WLAN Controller, a single chip solution featuring an IEEE 11a/b/g media access controller (MAC) and integrated baseband processor to support USB 2.0 host interface. Enabling data rates between wireless devices of up to 54 Mbps. WLAN modules based on the VIA VT6656 can deliver the bandwidth necessary for real-time streaming of high-definition digital multimedia content in home networks, and provide high-speed broadband access to multiple mobile users in a corporate environments or public hotspots. Product Package Posible Application Spec.